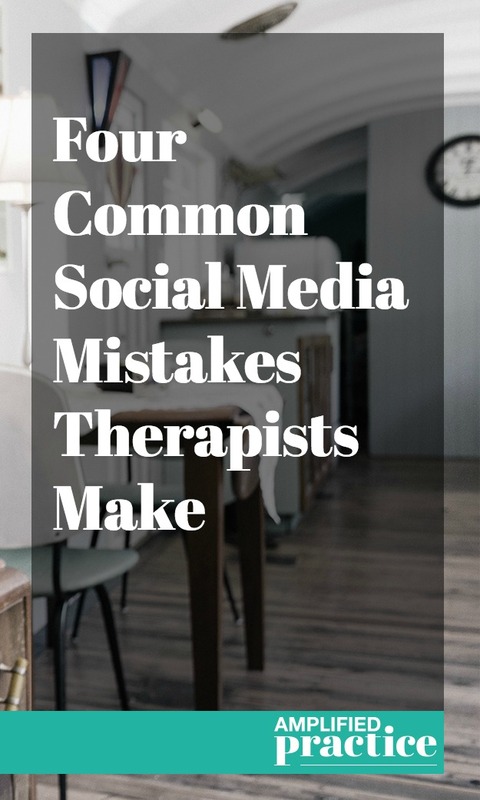 Lots of therapists want to start using social media to increase the reach of their online presence. But starting out on the wrong foot in social media can leave you spinning your wheels with ineffective strategy. Creating a consistent and credible online presence can really help you build trust with prospective clients. This means following through on agreements can help build rapport even when you're not present. Unfortunately, it can also break trust and diminish credibility if you miss the mark. Case in point: breaking promises. When you create social media profiles for your business and especially when you link them to your website you are offering them as an opportunity for clients to connect. So if you aren't using the social media profile anymore, never have, or step away for a while it leaves a gap for the client. To keep your social media promises in this sense all you have to do is commit to posting daily on whatever platform you share with clients. If you're not ready to commit to that kind of social media availability, wait until you are to move into this arena. Boundaries are one of the biggest concerns most counselors face when considering social media marketing. We worry about crossover from our personal accounts to our professional relationships. For this reason it's important you identify which accounts you want to use to market your practice and post only professional content. This increases credibility and helps keep a consistent message for prospective clients who want to work with you. The other way therapists often mis-use social media is by setting the wrong privacy boundaries. Accounts on Twitter and Instagram you have the option for you to make your profile private. When you are set on private others can see your profile picture, name, and that your profile is private. This is a great option if you plan to use the account for your personal life only. It works well for twitter and instagram specifically because there really is no privacy on those sites if you choose to use them. However, if you want to direct your clients there either through links on your site or by using your therapy business name or credentials in your account having a private account is confusing to your prospective clients. This privacy block confuses prospective clients who think you're using twitter and instagram marketing and resource sharing. For example, instead of using "Gina Senarighi MFT CPC" as my account name I might use "Gina Senarighi" only to help avoid crossover. And instead of linking it to my professional website or email signature, I would only share it with friends and family. Remember, even with your privacy set on these accounts twitter and instagram own the things you share and they can change their privacy settings anytime. To be on the safe side I recommend you don't share anything you don't want clients to find online. The final social media mistake I see counselors in private practice making is simply not knowing who they are marketing to. You can always create a strong presence online with social media casting a wide net, but each social media platform has a different reputation with specific audiences. You can spend a lot of time and energy with little return this way. If you want a more effective strategy you want to take time to research the different social media available and the audiences who engage most. Some populations are online more than others and some platforms are more popular with teens or women while others are focused on tech professionals or social media geeks. Social media can definitely support your private practice growth. Having a clear plan can help you use social media wisely to market your practice. Take time creating a plan to you can make the most of your time using these great tools. If you want 1:1 help creating a social media plan that reaches the right clients for your practice schedule a consultation with me now. I am happy to help. And if you want a supportive community to talk through marketing ideas join the conversation on the private Authentic Marketing for Therapists in Private Practice facebook group. I get it; you barely have time to write case notes- let along blog every single week. Plus, you have a whole personal life, family and/or day job you're BUSY- blogging just feels like one more thing. But blogging is essential to a thriving private practice in today's world. It helps increase SEO and traffic to your site and helps the right clients find their way to you. Most of the therapists I coach say they want an increase in SEO and traffic to their website- but they can't get up the gusto to start blogging. I wrote out seven simple tips to get your blogging organized. Check them out below. Having a blog schedule keeps you committed and organized. I set an appointment each week for my blogs. Seriously, I write in "appointment with future clients" one hour to help me remember how important this blog time is- I am connecting with future clients. I'm not going to blow that off. Having a clear plan for your blogging endeavors means having focused and efficient writing time when you actually do sit down to write it out. If you aren't using an editorial calendar now, you can download my free template here (and watch a video on how I use the calendar to keep three blogs going strong). Nothing is worse than dedicating tons of time to writing and then losing everything. I learned this lesson the hard way when I switched sites last year- I lost over 100 blog posts in one split second. Having a copy saved (I save mine in dropbox so I can get at them anywhere) means less time in the future re-writing if something is lost. Backing up my work also means I can easily re-write posts and tailor them to new or seasonally appropriate themes later. How to Set Boundaries at Your Gay Wedding becomes Coming Out at Christmas: Setting Boundaries with Family with just a little tailoring. Collaborating with other professionals is a great way to get both your blogs written on time, and to expand the reach of your audience. Make a list of other professionals you admire and invite them to share a post, or find a specific post and ask the author if they're willing to tailor it to share on your site as a guest post. I know you have resources you share with clients regularly. Make a list of your most commonly referred books, workshops, thought leaders, or blogs and write a post on them. List the resources and how they can help with a short description of why each is useful and voila! There's your blog post. You can do this quarterly or monthly as well. Another great way to connect with practitioners you admire is to start a series of interviews. Some of my colleagues at Be Nourished do this with their Body Trust Insights series, and it's both an easy way for them to write blogs and a simple way to connect with other practitioners and create collaboration opportunities. If you want more help blogging bravely in 2016 join the Blog Brave group coaching series to get your writing rolling with integrity and ease. Click the image below for more information. Coming up with blog topics is one of the biggest blocks to blogging therapists experience. But it is probably easier than you think. Here's one simple practice you can implement in under five minutes to generate multiple posts for this year and next! All it takes is a few minutes of focus. Get out something to write with and something to write on and join me by watching the video below. Then join us in the Authentic Marketing for Therapists in Private Practice private facebook group to share your thoughts! Most of the therapists I coach in building a private practice have a hard time starting their blog writing practice. Often the most daunting task is choosing a topic. We know so much, or want to say so much, or care so much it can be a little overwhelming to pin down titles and topics right away. Most of them don't realize great topics are right at their fingertips. Let's look at the resources and tools you use most often to get those first blogs rolling. Take out a pen and paper to write down ideas as you read- I know you'll have blog ideas by the end of this post! Every therapist I know has a stack of favorite books. We have a few best books we recommend over and over. Or we know a few great books on a particular topic (for example, the best books on divorce, ADHD, adoption, or coming out). Make a list of books you would want every client to read and two or three sentences why each book is great. There's one easy blog written right there! Similar to the book list, most of us have a list of favorite resources. You could make a list by client concerns, online, or specific to your local area. Once you have a list, find links to each resource online so you can include them in your blog. This helps connect you to similar pages online and helps your clients more easily connect with each resource from your blog. Most clients come to us with a particular problem in mind they want to solve. Brainstorm a few possible solutions and write a few sentences on how to implement them in daily life. Clients love having options available in action step format. Similar to problem solution, you could probably write a how to blog post on one of your client's most common concerns. For example; how to meditate, how to get more sleep, how to set boundaries with parents, or how to think positive. If you want to generate more of these ideas keep a notebook handy in your office just for blog ideas that arise in sessions. FAQ (frequently asked questions) sections of websites can be a great way to set expectations and boundaries with prospective clients before they ever enter your office. They also give you an opportunity to demonstrate your understanding for the client's concerns, and build trust and expertise. Start by making a list of the most commonly asked questions by prospective and first-time clients. Then write a short answer for each. Link these to your about page for more internal links in your site. Interviewing a colleague or respected leader in the field can be a great way for clients to get a feel for your conversational style. Send an introduction and a list of questions to those you admire and turn them into a Q & A post. You can also do this in an audio format by hosting a call and recording it with the professional you choose. But don't forget to include the text for your blog post! Finally, one of my favorites, the book review. Instead of just listing favorite book recommendations, take time to review a favorite and make suggestions for action for prospective clients. This both helps the reader and helps you further your learning. There you have it, seven easy blog topics for therapists. Odds are at least one of these is a possibility that can get things started for you today. If you feel really stuck in blogging feel free to call me for a free consultation, or join the Blog Brave support group for therapists. I would be happy to support your success!